This wasn’t a cheap victory either, 9 kills and two teammates that died right off the bat. The first time you test something, you check out its design, you try all the new features, but even after an hour or more, the device still doesn’t feel as familiar as something you own and use every day. 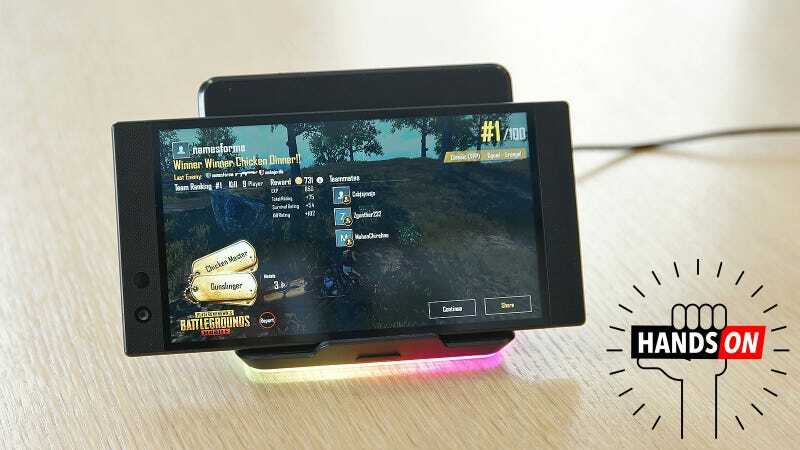 And yet, the first time I sat down and played a round of PUBG Mobile using the Razer Phone 2, I finished with a chicken dinner. Was it me or was it the phone? I’m still not sure, but here’s how Razer’s gaming phone has evolved for its second tour. At first glance, and especially from the front, the Razer Phone 2 looks almost identical to the original model. But upon closer inspection, you’ll notice that the front and rear cameras are in different locations, while in back, Razer has swapped out metal for glass. Original Razer Phone on the left, Razer Phone 2 on the right. These two things hint at major improvements on the Razer Phone 2 that should be boon to all users and not just gamers. By taking advantage of the glass back, Razer Phone added wireless charging, while the new camera modules offers improved photography including built-in optical image stabilization, faster autofocus, and enhanced HDR. This is a big deal because blurry, lackluster images were one of my biggest complaints about Razer’s first phone. Even though it’s made for gamers, there’s no excuse for skimping on “traditional” phone duties. The other big change is the addition of RGB lighting. Last year, it seemed preposterous that Razer made a gaming phone without flashy colored lights, but now it’s here, and it’s not purely just for show. Thanks to Razer Chroma integration via a new mobile app, those RGB lights can be programmed to blink and pulse different colors depending on the situation. You can program it to flash blue when you get a text, or red if you get an email from your boss, and because the app works by analyzing your notifications, there’s essentially an endless amount of customization. Like its predecessor, the Razer Phone 2 still has a home button with a built-in fingerprint reader on its side. Still no headphone jack, though you will get a dongle in the box. Inside, the Razer Phone 2 has also been upgraded with beefier specs including a Qualcomm Snapdragon 845 chipset, 8GB of RAM, and new dual-stereo speakers with Dolby Atmos tech. As gaming on a phone tends to lead to toasty phones Razer even crammed a massive vapor chamber cooling system about the size of a business card into the phone. Thankfully, Razer didn’t mess with the 120Hz LCD screen or big 4,000 mAh battery from last year’s handset, which were innovative, category-defining features that made the idea of a gaming phone so intriguing in the first place. Now though, the screen is significantly brighter with a claimed peak output of 645 nits (versus just 350 nits on the original), and with Gorilla Glass 5 in front for increased toughness. In fact, the Razer Phone 2 as a whole should be much easier to live with due to the addition of IP67 water resistance. So how ‘bout them games? When you got everything going, the 120Hz screen still impresses. It makes everything look crisp, even on games like PUBG that are normally capped at 60fps. And due in part to the success of last year’s device, Razer says it has even more game developers looking to partner up and add better support for displays with higher refresh rates. Along with the Chroma app for controlling the phone’s lighting, Razer has also created Cortex, an app which serves as a place to both tune games to your preferred settings and performance and discover new ones based on the kind of titles you already enjoy. The Cortex apps lets you adjust things like CPU clock speed, resolution, anti-aliasing, and more. And in addition to the Razer Phone 2, Razer is also releasing a new gamepad with a built-in mount made to hold a wide range of phones, new USB-C noise-canceling earbuds, and a surprisingly powerful 15-watt wireless charger that also has RGB lights that automatically sync with the Razer Phone. The big potential downside to all this is that the Razer Phone 2 ain’t cheap. It starts at $800 for the slick glass-backed model seen above and 64GB of storage, or $900 for a model with a matte glass back and 128GB of storage. Pre-orders start tomorrow, with shipments scheduled to go out sometime in late October or early November.